Firefox Firebug update has removed css path facility. Where can I find it? The latest version of Firefox has led to the removal of a useful tool in the Firebug extension which I use a lot in website design, namely the copy css path. I used to open Firebug and select the required element. By right hand clicking I could copy and paste the correct css path to be able to edit this element. I've played around with the new version including adding Firepath but I can't seem to find how to simply copy and paste the path I need. This was the most important tool so it seems odd it's been removed. Can anyone advise me how to get it back? Or another way to do find the path simply and quickly? The feature you are looking for is supported in the native Firefox developer tools. 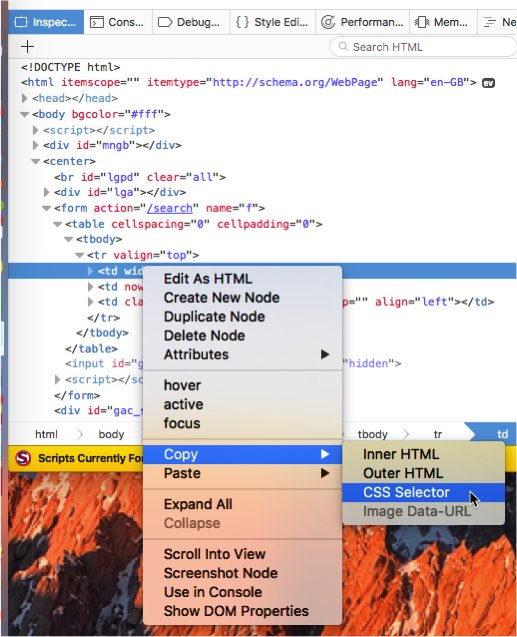 Find the element in the element selector, and then look under "Copy" for "CSS Selector" in the context menu. As noted by Quentin, Firebug is officially discontinued and it does not work anymore once multi-process Firefox is enabled. What you see are actually the Firefox DevTools, which do not provide the same functionality as Firebug yet (as of Firefox 50.1). They have a Copy > CSS Selector option, which copies a short CSS selector, though an option to copy the full CSS selector is still missing. It is requested in bug 1323700. Not the answer you're looking for? Browse other questions tagged html css firefox firebug or ask your own question. Does the Firefox Web Developer Toolbar have an equivalent of Firebug's “Inspect Element” CSS live-debug feature? How can I remove a style added with .css() function? How can I adjust my CSS so that Firefox respects the padding when child tag has width: 100%? How to find absolute path to @font-face fonts with Firebug?